To say I wasn’t an adventurous eater as a child is an understatement. Had someone presented me with any of the aforementioned items, I most likely would have become apoplectic. In my mind, these weren’t food items, these were threats – dares even – that would have resulted in the physical challenge. As a child, I vividly remember proclaiming my disgust for things like spaghetti and squash yet somehow I thought it was acceptable to try dog food. Needless to say, it came as a surprise when in high school I found myself armed with a large spoon, sneaking out to my best friend’s garage refrigerator to get yet another helping of split pea soup. Seriously. 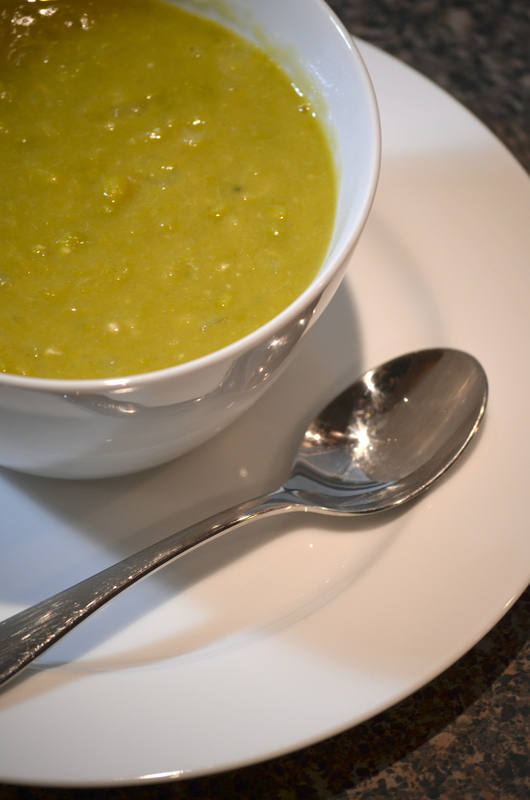 Split pea soup. The soup of nightmares, of lore, of foggy weather reports. 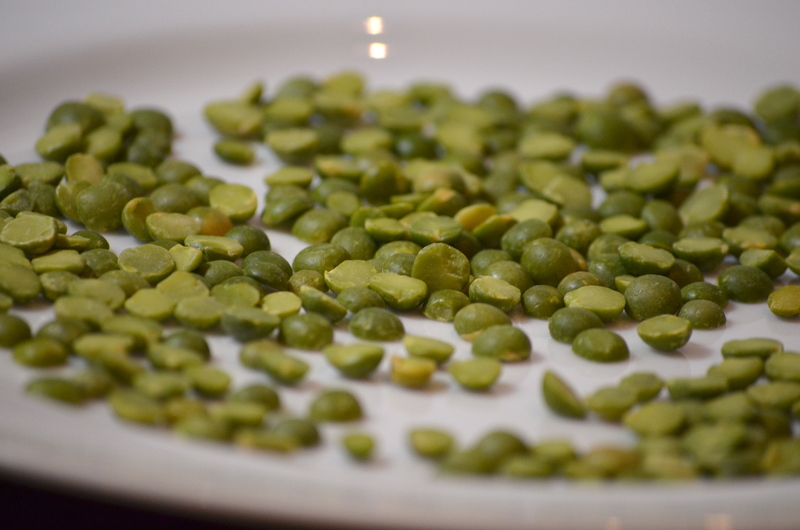 The red-headed stepchild of shades of green, split pea has been mocked, derided and scorned for as far as I can tell, no good reason. Yet another soup that my husband initially regarded with disgust (“do you puree it at least?”) has become part of our repertoire and of course, the only recipe I’ll use is the one from the best friend’s garage refrigerator. I hope Mary isn’t upset that I’m sharing the recipe but I have to assume that she aims to rid the world of split pea prejudice just as I do and is willing to lay it on the line for a good cause. This is a very easy recipe, one that only requires the forethought to soak the peas the night before you want to make the soup. The meat for the soup can vary, I’ve used smoked ham hocks and fresh ham hocks (these are fresh, and what I prefer to use) and I would imagine if you had leftover ham from a Thanksgiving or Christmas meal you could recycle it into this soup. Begin by sorting through your peas and checking for rocks, pebbles, rogue other beans or peas and the like. 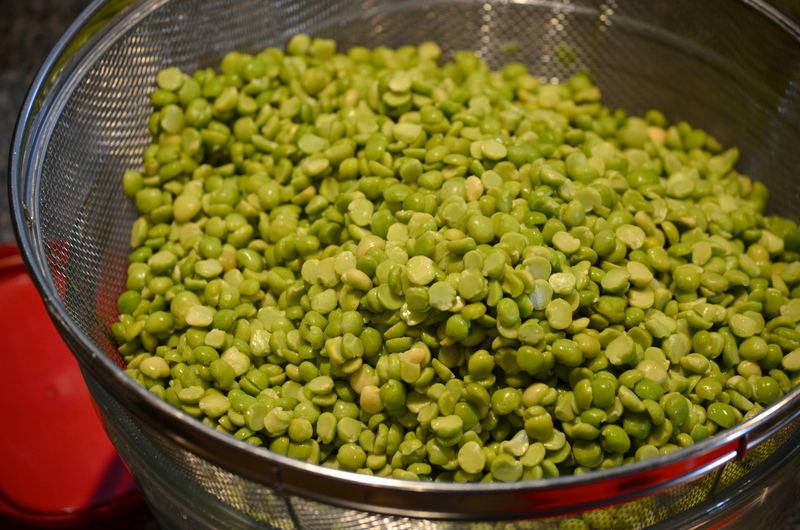 Put your peas in a large bowl and cover with water. Soak overnight. 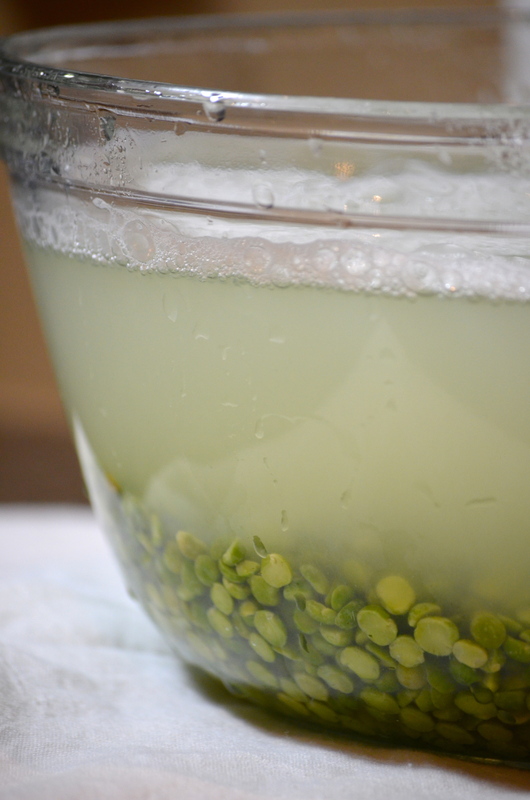 When you’re ready to cook your soup, drain the soaked peas and give them a quick rinse. Grab a large dutch oven or stock pot and heat over medium high heat. 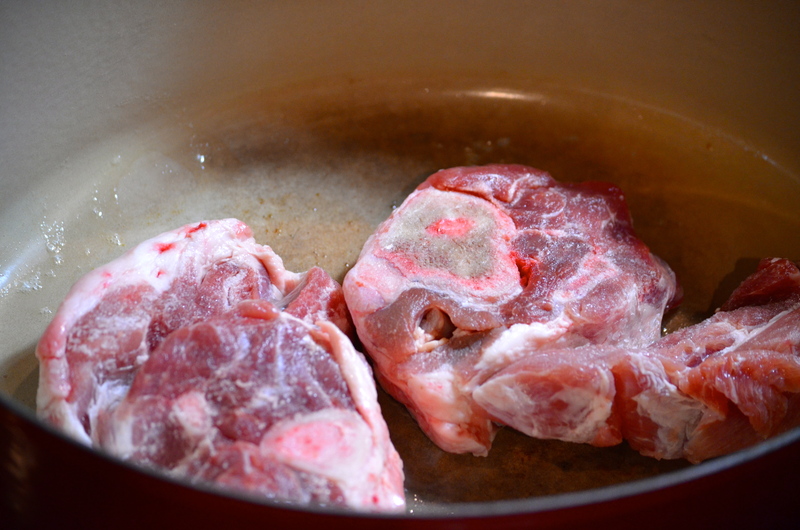 Add some butter or oil to the bottom of the pan and brown your ham hocks. 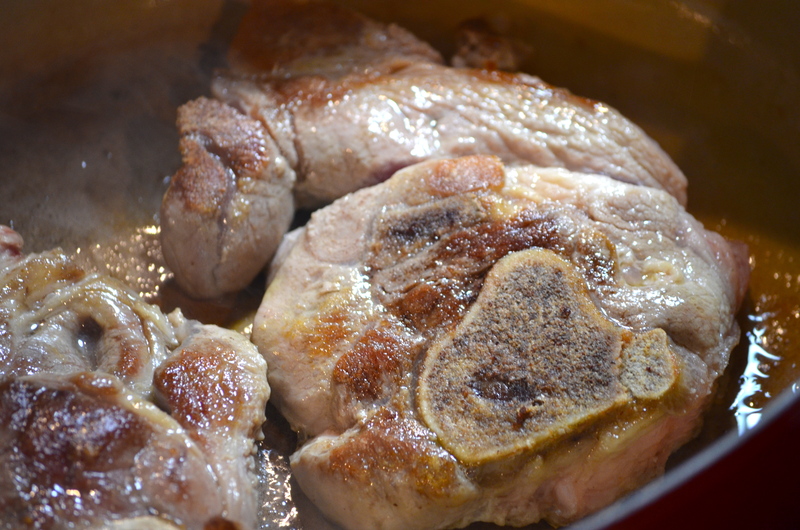 Once the hocks start glistening in all their golden-brown glory, go ahead and pull them out of the pan and add about 2 tablespoons of butter or oil and reduce the heat to medium. 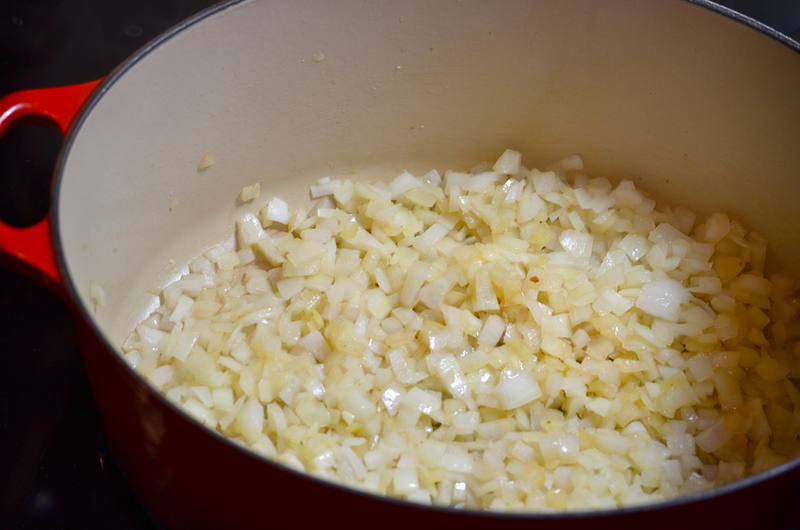 Add your diced onions and a 1/2 teaspoon of salt, taking care to scrape up the brown bits from the bottom as you go. That fond (which means bottom or back in French, depending on how you use it) from the ham will flavor the onions and the soup. How many of my recipes have this picture in them? If I could brown onions to put in cookies I would. I digress. Cook your onions for about 10 minutes until they become translucent and now it’s time to dump. 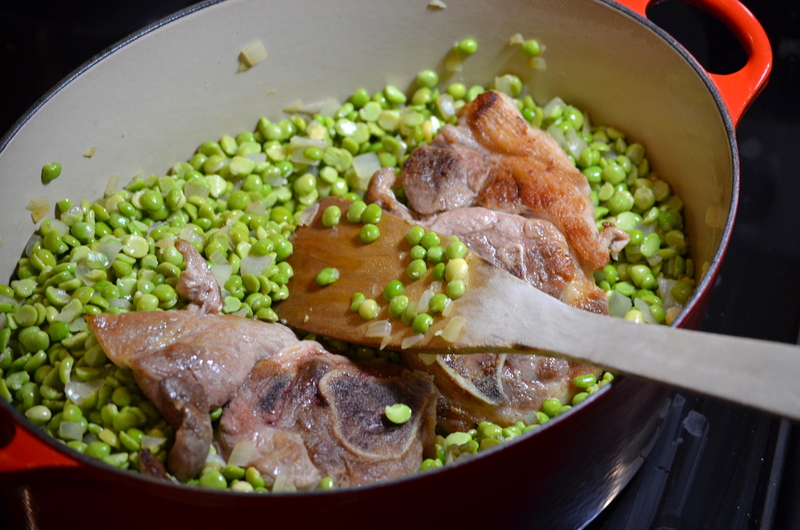 Add the peas to the pot and stir them around to give them a chance to rub elbows with the ham flavors. Then nestle in your browned ham hocks for a soup jacuzzi. Add enough water to just cover the peas and ham. Bring the soup to a boil and then reduce to a simmer. Cover and cook an hour and a half, stirring occasionally so nothing burns on the bottom. After about an hour and a half, your peas will have begun to break down. Remove the cover and continue to cook until all the peas are soft (do the 5-bean test: try 5 separate peas. If all of them are tender, then you can consider them all to be cooked. If even one is still crunchy, keep on cooking). I’d say that would be another hour and a half to two hours. Season with salt and pepper. As for the meat, at this point it will have become tender and started to come apart. Fish out the large pieces of bone from the soup. You can retrieve the ham hocks and use your hands to break the meat into bite-sized pieces, or you can do like me and just use a wooden spoon and go after the meat in the soup in an impatient stabbing manner. Ladle the goodness up and serve with a grilled cheese sandwich or salad or just by itself on a rainy night. Look at that color! I just realized it’s the same color as my living room. This soup is so satisfying. It has a pureed texture without having to puree it and it freezes really well. When you’re ready to reheat it, sneak to the fridge with a large spoon and grab yourself a “loaf” of the soup. You’ll understand how this soup stays on a spoon across a house once you make it. I am soooo honored! 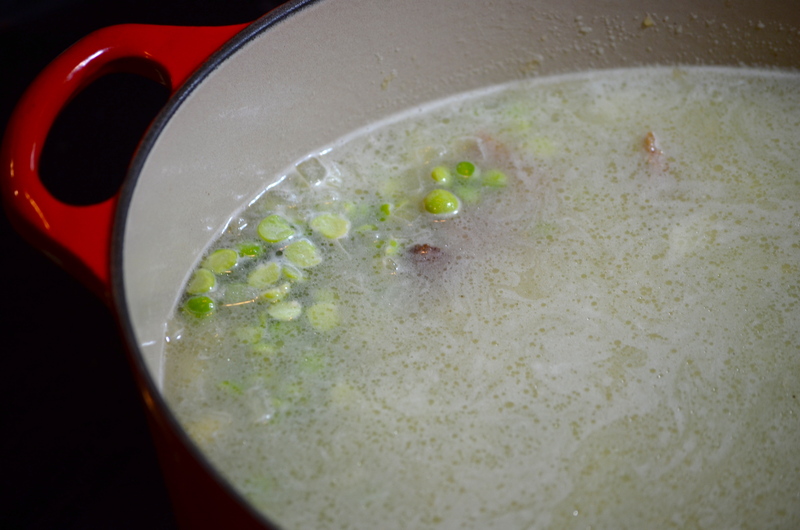 Having never measured or timed anything when I am making split pea soup, it is nice to see how it should be made! Don’t be silly! The way it should be made is by you! But this will have to do… until I can get into your garage.